Just as South African anti-apartheid activists had called on international artists, writers and cultural institutions to culturally boycott South Africa, PACBI urges international cultural workers and cultural organizations, including unions and associations, to boycott and/or work towards the cancellation of events, activities, agreements, or projects involving Israel, its lobby groups or its cultural institutions. International venues and festivals are asked to reject funding and any form of sponsorship from the Israeli government. Thousands of artists across the world now refuse to perform in Israel, including a host of global superstars such as Roger Waters from Pink Floyd, Lauryn Hill and Chuck D.
Israeli government officials have summed up how Israel instrumentalizes culture to cover up its grave violations of international law. "We are seeing culture as a hasbara [propaganda] tool of the first rank,” one official admitted, “and I do not differentiate between hasbara and culture." The Israeli ministry of foreign affairs provides funding to Israeli artists and writers with the condition that they as “service providers” should “promote the policy interests” of Israel. Many Israeli artists act as “cultural ambassadors” for the state. When international artists perform at Israeli cultural venues and institutions, they help to create the false impression that Israel is a “normal” country like any other. The absolute majority of Palestinian writers, artists and cultural centers have endorsed the cultural boycott of Israel, and there is a growing number of anti-colonial Israelis who support BDS, including the cultural boycott of Israel. In response to PACBI, and to distract from and whitewash its crimes against the Palestinians, Israel launched the “Brand Israel” campaign in 2005. Following its 2009 massacre in Gaza, for example, an Israeli official announced a plan to “send well-known novelists and writers overseas, theatre companies, exhibits” to “show Israel’s prettier face”. Israeli artists who receive state funding to perform overseas often sign a contract pledging “to promote the policy interests of the State of Israel via culture and art, including contributing to creating a positive image for Israel,” thus forfeiting any claim to artistic freedom. Some international venues are increasingly reluctant to accept Israeli government funding or host artists/writers funded by the Israeli government. When international artists perform at Israeli cultural venues and institutions, they help to create the impression that Israel is a normal country like any other. Israel celebrates visits by international artists as a sign of support for its policies. For example, when Alicia Keys violated the boycott and performed in Tel Aviv in 2013, her visit was proudly tweeted at least eight times by Israel’s Ministry of Foreign Affairs. A growing number of artists, including superstars like Roger Waters from Pink Floyd, Lauryn Hill and Chuck D, now refuse to perform in Israel. Many others exercise a “silent boycott” by refusing to schedule cultural events in Tel Aviv without publicly supporting BDS. 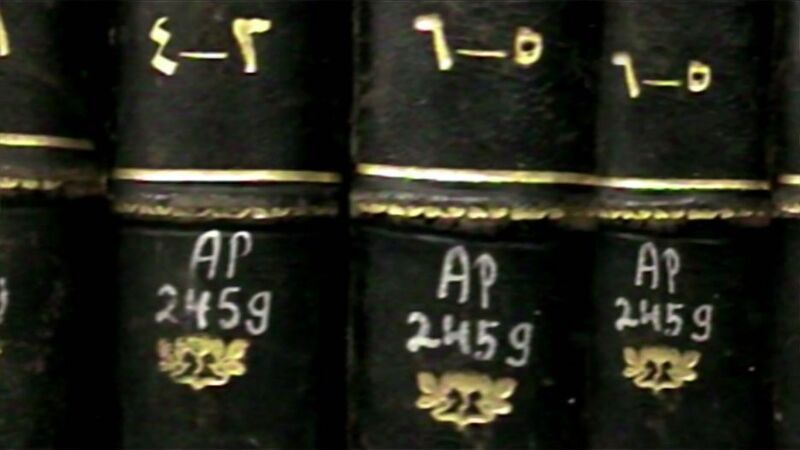 During the 1948 Nakba (Zionist ethnic cleansing of most of the indigenous Palestinians), Zionist militias and later Israel plundered and/or destroyed tens of thousands of Palestinian books. In 2009, the Arab League and UNESCO designated Jerusalem as Capital of Arab Culture for that year. Israel banned the celebrations and its police broke up cultural gatherings in venues across occupied East Jerusalem. During Israel’s military invasion of Ramallah in 2002, soldiers ransacked cultural centers and destroyed original manuscripts belonging to Palestinian poet Mahmoud Darwish. For more examples see: The Case for a Cultural Boycott of Israel (Artists for Palestine UK). Israel’s regime of oppression against the Palestinian people may be a special cocktail of occupation, settler-colonialism, and apartheid. But some leading South African figures, like Mandela government minister Ronnie Kasrils and Christian leaders who fought apartheid, have argued that Israel is a more sophisticated, evolved and brutal form of apartheid than its South African predecessor. Those who are now hesitant to support an institutional cultural boycott of Israel while having in the past endorsed a blanket cultural boycott against apartheid South Africa are hard pressed to explain this inconsistency. In 2004, the Palestinian Campaign for the Academic and Cultural Boycott of Israel (PACBI), a collective of Palestinian academics, artists and cultural workers, issued a call for a cultural boycott of Israel. The call urges international artists, cultural workers and cultural organisations to boycott and work towards the cancellation of and activities that involve Israel, its lobby groups and complicit institutions or that whitewash Israel’s human rights violations. Find out more by reading the full call or the cultural boycott guidelines. As awareness of Israel’s oppression of Palestinians grows, more and more artists from across the world are joining the cultural boycott. Support for the cultural boycott and cancellations of performances receive very significant media exposure in Israel, showing ordinary Israelis that there is increasing opposition to Israel’s denial of Palestinian rights. Thousands of artists and cultural workers have signed public statements in support of the cultural boycott. In 2015, more than a thousand cultural figures in the UK signed a cultural boycott pledge. BDS-related initiatives have been launched in Montreal (Canada), Ireland, South Africa, Switzerland, Lebanon, the US, among others. 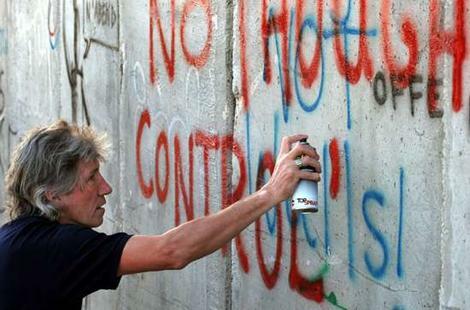 Distinguished cultural figures who have endorsed the cultural boycott of Israel include the late Stéphane Hessel, Holocaust survivor and contributor to the Universal Declaration of Human Rights, Chuck D (pictured left), Roger Waters (pictured above spray painting apartheid wall), Talib Kweli, John Berger, Arundhati Roy, Iain Banks, Judith Butler, Junot Diaz, Naomi Klein, Ken Loach, Alice Walker, Angela Davis, Mira Nair, Mike Leigh and many others. 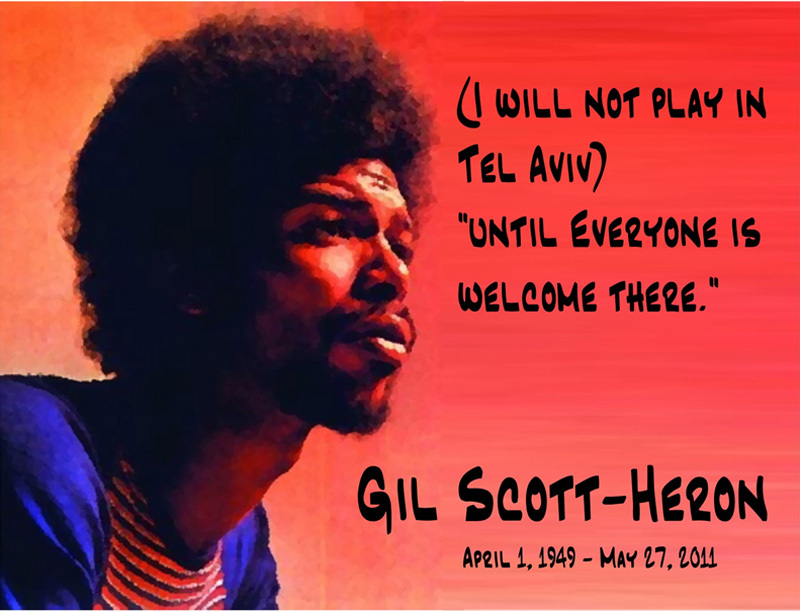 Top artists including Elvis Costello, Gil Scott-Heron, Lauryn Hill, Faithless, Marianah, U2, Bjork, Zakir Hussain, Jean-Luc Godard, Snoop Dogg, Cat Power, and Vanessa Paradis have cancelled performances in Israel or declined to perform there. Despite offering large sums of money to international artists to defy the cultural boycott, Israeli promoters complain that it is becoming increasingly hard for them to attract famous artists. Boycott related protests at the 2014 Edinburgh Fringe saw two state-funded Israeli troupes ejected from the festival, while two other Israeli troupes not connected to the Israeli State performed unimpeded. No Israeli State-funded troupes came in 2015. In 2014, the prestigious São Paulo Biennial festival ended an Israeli sponsorship deal following calls to do so by a vast majority of the participating artists. The message that BDS targets Israel’s regime of oppression and its cultural ambassadors is getting through to Israeli artists. The cultural boycott of Israel is entering the mainstream, thanks to the tireless work of progressive artists and BDS campaigners. Artists have an especially important role to play. If you’re an artist, please show your support for the cultural boycott of Israel and persuade your fellow artists to do the same. Join the cultural boycott of Israel! Refraining from participating in cultural events in Israel or in Israel-funded activities around the world is the most important expression of support the Palestinian call for a cultural boycott of Israel. If you’re in the US, South Africa, the UK, Ireland, Canada, Switzerland or France there are public pledges in support of the cultural boycott that you can add your name to. Tell people about your support for the cultural boycott! If you’re an artist that supports the cultural boycott, tell the whole world! Share information about the cultural boycott through your social media channels and when you meet others at performances and exhibitions. Share with colleagues that you don’t perform or exhibit your work in Israel. Share your public statement with us so we can help to publicize it. PACBI sometimes launches international public campaigns that often convince famous artists not to perform in Tel Aviv, just as conscientious artists boycotted Sun City. Follow PACBI on social media and check back on this page for details of any ongoing public campaigns. Your help in such campaigns would be well appreciated. Organising a statement of support for the cultural boycott from hundreds of artists in a particular country or genre/field is a long term and difficult process but can be a very effective way to spread the word about cultural boycott and bring new people on board. Contact us so we can share with you our related experiences and best practices. Organising a speaker event, debate or a teach-in can be a great way to bring people together to discuss and learn about the cultural boycott. Contact us for suggested speakers and ideas on organising a teach-in or debate. Mobilise appeals to convince your local cultural venue not to accept Israeli government of lobby funding or host events sponsored by Israel, its lobby or complicit institutions. The reference for the cultural boycott of Israel is the Palestinian Campaign for the Academic and Cultural Boycott of Israel (PACBI), a collective of Palestinian academics, artists and cultural workers. PACBI is a founding member of the Palestinian BDS National Committee (BNC), the broadest coalition in Palestinian civil society that leads the global BDS movement and runs the BDSmovement.net website. PACBI has set out detailed guidelines outlining the principles of the cultural boycott and how it should be implemented in order to be in coherence with the PACBI call for a cultural boycott. This page is a summary of those detailed guidelines. It is intended to give artists and supporters a general sense of the principles of the cultural boycott. If you are trying to establish whether or not an institution, project or event is boycottable, it is important that you consult the full cultural boycott guidelines and/or contact PACBI. PACBI urges international artists, cultural workers and cultural organisations to boycott and work towards the cancellation of and activities that involve Israel, its lobby groups and complicit institutions or that whitewash Israel’s human rights violations. This is a boycott of Israeli cultural institutions not Israeli individuals. BDS targets complicit, not identity. The cultural boycott of Israel should continue until Israel meets the three demands of the BDS call. Israeli cultural institutions can avoid being targeted by the boycott if they meet the three demands of the BDS call and end all forms of support for Israeli violations of international law. International artists are asked not to perform or exhibit in Israel. This is because performances in Israel help to create the impression that Israel is a “normal country”, thus whitewashing its violations of Palestinian human rights. Israel considers performances in Tel Aviv as endorsement of its policies. Palestinians reject the idea that the damage done by an artist performing or exhibiting their work in Israel can in some way be compensated for by a parallel performance or exhibition in occupied Palestinian territory. This attempt at “balance” undermines Palestinian rights. As a general overriding rule, Israeli cultural institutions, unless proven otherwise, are complicit in maintaining the Israeli occupation and denial of basic Palestinian rights. Israeli cultural institutions provide support to Israel’s crimes whether through their silence or actual involvement in justifying, whitewashing or otherwise deliberately diverting attention from Israel’s violations of international law and human rights. Israeli cultural institutions include music bands, orchestras, dance troupes, theatre companies, film production companies, film festivals, museums, etc. Israeli artists that receive state funding often sign a contract promising to be a good ambassador for Israel and its policies. Any resultant cultural product or event is clearly boycottable. 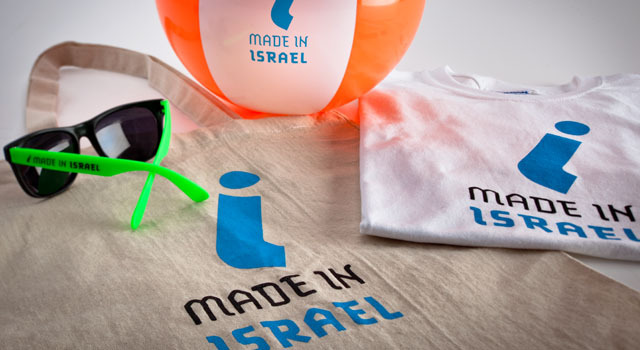 All non-Israeli (e.g., international, Palestinian) cultural products that are funded by official Israeli bodies or international “brand Israel” organizations are politically motivated and should be subject to boycott. Israeli cultural products that receive state funding as part of the individual cultural worker’s entitlement as a tax-paying citizen, without her/him being bound to serve the state’s political and propaganda interests, are not boycottable. The general principle is that any cultural activity or event carried out under the sponsorship of or in cooperation with an official Israeli body, Israeli lobby group or a complicit institution constitutes complicity and therefore is deserving of boycott. The same may apply to support or sponsorship from non-Israeli institutions that serve Israel’s branding/propaganda purposes. Events and activities include art exhibits, film screenings, festival, plays, conferences, performances (music, dance, etc. ), tours, among other activities. In the Palestinian context, normalization refers to any activity that creates the impression that Israel is a state like any other and that Palestinians, the oppressed, and Israel, the oppressor, are both equally responsible for “the conflict”. Far from challenging the unjust status quo, such projects contribute to its endurance, are intellectually dishonest and should be boycotted. An example of a boycottable normalization project would be a joint event that is designed explicitly to bring together Palestinians/Arabs and Israelis so they can present their respective narratives or perspectives, or to work toward reconciliation without addressing the root causes of injustice. However, a joint project is not boycottable if: (a) the Israeli party in the project recognizes the comprehensive Palestinian rights under international law (corresponding to the 3 rights in the BDS call); and (b) the project/activity is one of “co-resistance” to oppression rather than “co-existence” under oppression. Fact finding missions that are sponsored by Israel, Israeli institutions or lobby groups are boycottable. Supporters of justice around the world may call for a boycott or protest against an individual in response to their individual complicity in, responsibility for, or advocacy of violations of international law or other human rights violations. While an individual Israeli artist’s freedom should be fully and consistently respected in the context of cultural boycotts, an individual, Israeli or otherwise, cannot be exempt from being subject to this kind of “common sense” boycott. What is the cultural boycott of Israel? In 2004, the Palestinian Campaign for the Academic and Cultural Boycott of Israel (PACBI) called for a boycott of Israeli academic and cultural institutions. It is the part of the Palestinian BDS National Committee (BNC) tasked with overseeing the academic and cultural boycott aspects of BDS. The cultural boycott was called for in response to the active involvement of Israeli cultural institutions in maintaining and whitewashing Israel’s occupation, colonisation and apartheid. It urges individuals and organisations to boycott Israeli cultural institutions, and calls on artists to refuse to perform in Israel. 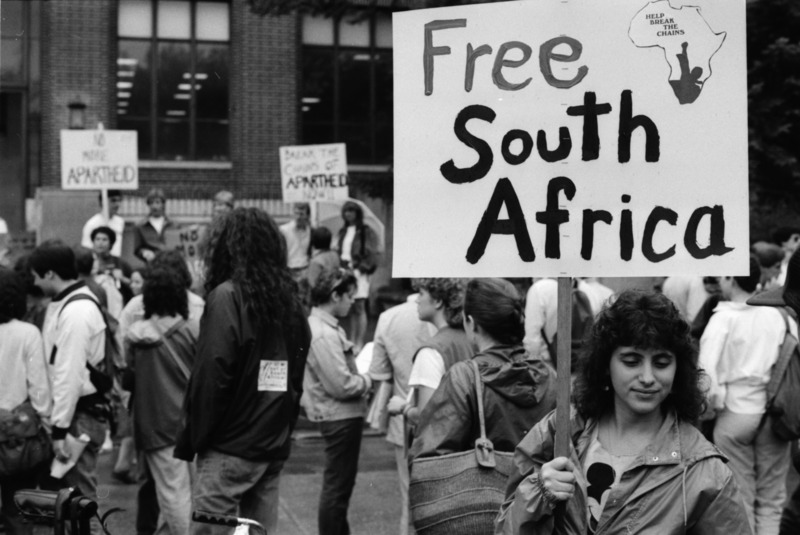 The cultural boycott of apartheid South Africa was a key inspiration for the Palestinian boycott calls and their criteria, despite some crucial differences. In particular, the Palestinian boycott, unlike the South African cultural boycott, is institutional and does not target individuals as such. There is a growing number of anti-colonial Israelis who support BDS, including the cultural boycott of Israel. How are Israeli cultural institutions complicit in Israeli violations of Palestinian rights? Why a cultural boycott of Israel? A boycott of complicit Israeli cultural institutions would expose their whitewashing role and pressure them to end their complicity. Boycott, at the most fundamental level, constitutes “withdrawing … cooperation from an evil system,” as Martin Luther King, Jr. said. In turn, BDS calls on people of conscience and their institutions to fulfill their moral obligation to end complicity in Israel’s system of oppression. What are the principles of the cultural boycott? The cultural boycott of Israel is institutional and conforms to the definition of freedom of expression as stipulated in the United Nations’ International Covenant on Civil and Political Rights (ICCPR). BDS rejects censorship and upholds the universal right to freedom of expression. The BDS movement, including PACBI, is anchored in precepts of international law and universal human rights. It rejects on principle boycotts of individuals based on their identity (such as citizenship, race, gender, or religion) or opinion. Mere affiliation of Israeli cultural workers to an Israeli cultural institution is therefore not grounds for applying the boycott. Are there guidelines for implementing the cultural boycott of Israel? Yes. You can read the Guidelines for the International Cultural Boycott of Israel on this page (select resources on the left hand side). If you need further advice or guidance in navigating a grey-area case, as many cases tend to be, please contact us at: [email protected]. Does the boycott target individual artists? No. Our cultural boycott targets institutions, not individuals. The only exception is when an individual cultural worker is an official representative of the state or a complicit Israeli cultural institution or when an international cultural event (whether of an individual artist or a group) is sponsored or funded by the state or an Israel-lobby group. An individual artist/writer, Israeli or otherwise, cannot be exempt from being subject to “common sense” boycotts that may be called for in response to egregious individual complicity in, responsibility for, or advocacy of war crimes or other grave human rights violations; incitement to violence; etc. This, however, is beyond the scope of the PACBI institutional boycott criteria. At this level, Israeli cultural workers should be treated like all other offenders in the same category, not better or worse. Why are artists asked not to perform in Israel? Are Palestinian citizens of Israel asked to boycott Israeli cultural institutions? No. BDS guidelines distinguish between coercive and voluntary relationships. Palestinian citizens of Israel live under Israeli apartheid. As citizens and taxpayers, they cannot but engage in everyday relations with Israeli institutions. This includes employment in Israeli workplaces and the use of public services such as schools, universities and hospitals. These relations are not unique to Israel, and were present in colonial contexts in India and South Africa. Thus, Palestinian citizens of Israel are not asked to boycott Israeli institutions. Won’t the cultural boycott hurt artists in Israel who are largely progressive? The claim that the boycott would hurt Israeli artists who are “largely progressive,” aside from being quite disingenuous and based on a false premise, is in fact intended to deflect attention from three basic facts. First, that the boycott was called for because Israel was denying Palestinians their basic rights, including cultural rights and freedoms. Second, that the Palestinian cultural boycott of Israel targets institutions, not individuals. Third, that those institutions, far from being more progressive than the average in Israel, are a main pillar of the Israeli structure of colonial and apartheid oppression. The absolute majority of Jewish-Israelis, including artists, deny the basic UN-stipulated rights of the majority of the Palestinian people—the refugees—and support maintaining Israeli apartheid. Is the cultural boycott effective? Yes! Many factors point to the success of the cultural boycott of Israel. The Israeli government has invested significant resources to fight the growing cultural boycott of Israel. Israel realizes that its cultural isolation is increasing as BDS goes mainstream. 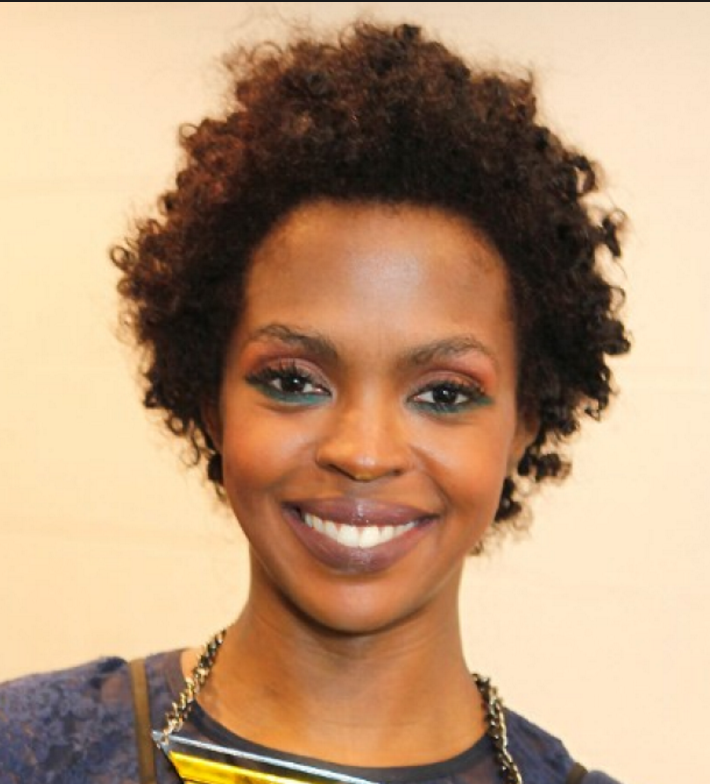 Highlighting her commitment to “justice and peace,” the iconic US R&B singer Lauryn Hill cancelled a scheduled performance in Tel Aviv in 2015, after appeals from Palestinian, Israeli, and international BDS activists. Distinguished artists, writers and public intellectuals who have endorsed or heeded the cultural boycott include the late Stéphane Hessel, Holocaust survivor and contributor to the 1948 Universal Declaration of Human Rights; John Berger; Arundhati Roy; Judith Butler; Naomi Klein; Ken Loach; Alice Walker; Angela Davis; Mira Nair; Roger Waters; Snoop Dogg; Brian Eno; Jean Luc Godard; Elvis Costello; Gil Scott Heron; Faithless; Zakir Hussain; Mike Leigh and many others. Are there differences between the cultural boycotts of South Africa and Israel? Yes, there is a major difference. BDS calls for a boycott of Israeli institutions, not individuals. 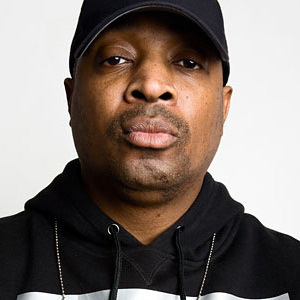 The BDS movement, including PACBI, rejects on principle boycotts of individuals, including cultural figures. The South African boycott was a blanket boycott that targeted both institutions and individuals. Those who are still reluctant, on principle, to support a boycott that expressly targets Israel's cultural institutions while having in the past endorsed, or even struggled to implement, a much more sweeping boycott against apartheid South Africa’s artists and cultural institutions are hard pressed to explain this peculiar inconsistency. I am an Israeli artist. How can I support the boycott? Doesn’t the cultural boycott stifle freedom of expression? No. PACBI rejects censorship and subscribes to the internationally-accepted definition of freedom of expression as stipulated in the United Nations’ International Covenant on Civil and Political Rights (ICCPR). 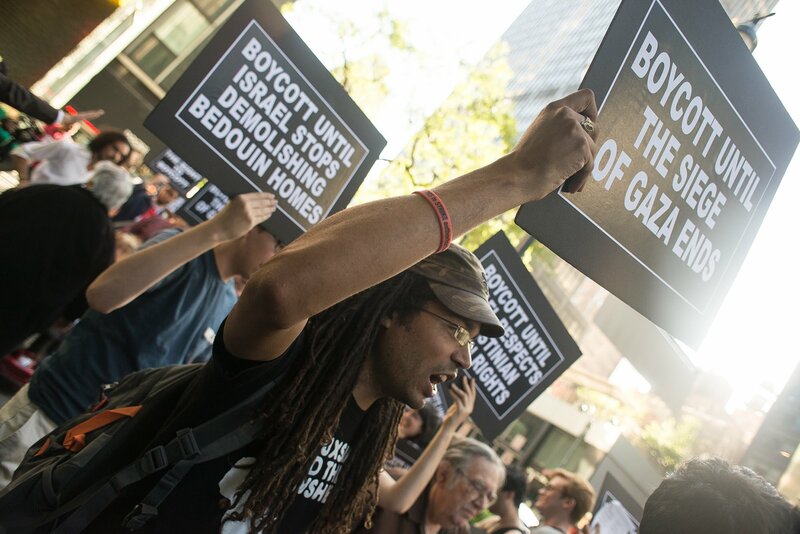 The BDS movement, including PACBI, rejects on principle boycotts of individuals based on their identity (such as citizenship, race, gender, or religion) or opinion. Mere affiliation of Israeli cultural workers to an Israeli cultural institution is therefore not grounds for applying the boycott. If, however, an individual is representing the state of Israel or a complicit Israeli institution, or is commissioned/recruited to participate in Israel’s efforts to “rebrand” itself, then their activities are subject to the institutional boycott the BDS movement is calling for. I am an artist and I support Palestinian rights. Why should I support the boycott? BDS is the most effective way to support Palestinian rights. It is what the overwhelming majority of Palestinian civil society organisations has called for. There are many ways to support the boycott. Get in touch with your local solidarity group for more information. How do I support the cultural boycott of Israel? There are many ways to support the cultural boycott of Israel depending on your location and affiliation. The BDS movement operates on the principle of context sensitivity, meaning that local organisers know best how to support the boycott, while respecting the Palestinian-set guidelines. Cultural workers and organisations have worked towards canceling events that violate the boycott, for example. Others have organised mass pledges of artists in support of the boycott. If you haven’t already, you can get in touch with your local solidarity group for more information. ​ Check out the Take Action section of this page for more information and ideas. When there are worse regimes of oppression around the world, doesn’t the academic boycott single out Israel?